Fidel Sarmiento’s “Ang Kubo sa Kabukiran” oil pastel is a depiction of rural Philippines. The bahay kubo in the middle of a fertile farmland is the farmer’s dwellings and resting area. The green rice fields and blue skies signifies farming season. 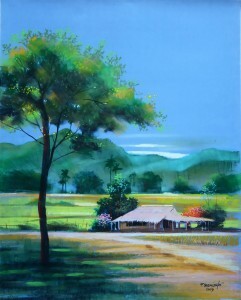 While the trees and the green mountain range represents the wet season. A bahay kubo is a typical one-story construction of a one-room hut. The hut located in the fields with an adjacent little kitchen with bathroom. It is with bamboo posts and nipa sidings and roof. The floors are of bamboo strips and scrubbed with a coconut husk. Fidel’s Ang Kubo sa Kubiran scenery is typical in the lowlands where bamboo and nipa palms are plentiful. 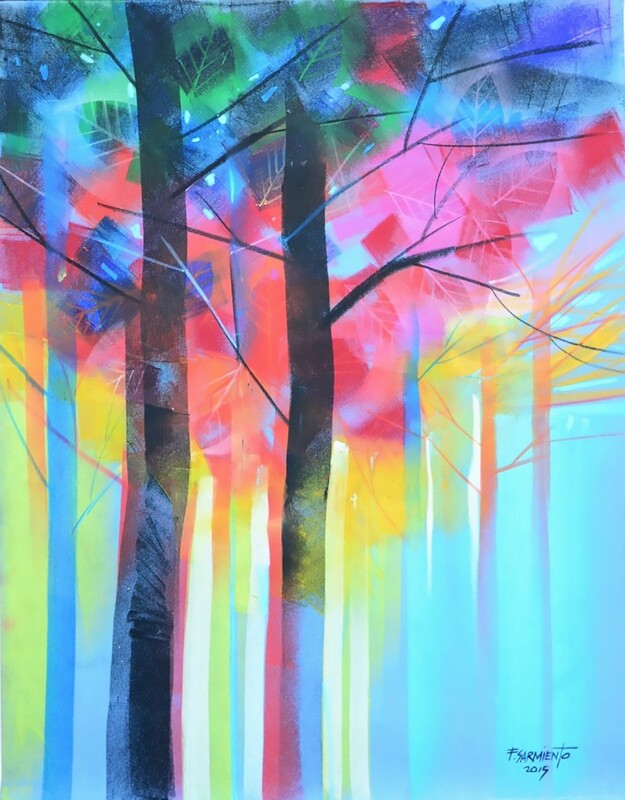 This painting portrays the reality that our environment plays important parts in our lives. The rice fields are a major source of food in our culture while the nipa hut is a form of dwelling and shelter used in rural communities. Fidel Sarmiento’s “Ang Kubo sa Kakahuyan” oil pastel is an image of a bahay kubo on stilts where it is plentiful in mountainous regions where trees and foliage are lush. In this second painting, Fidel Sarmiento portrays diversities in these homes according to the climate in the region and the availability of building materials. In the mountains, kugon grass is often used for roofs and sidings. Many huts in the coconut region are made of coco wood, from the trunks of coconut trees. The coconut palms can also be used for roofing. Fidel Sarmiento’s “Kakayuhan” oil pastel on felt paper communicates urgent message deforestation to abuse in the past decades. Hectares and hectares of denuded portions which are composed of mixed bushlands and grassland including patches of cultivated land which calls for an immediate forest reserve and reforestation program. 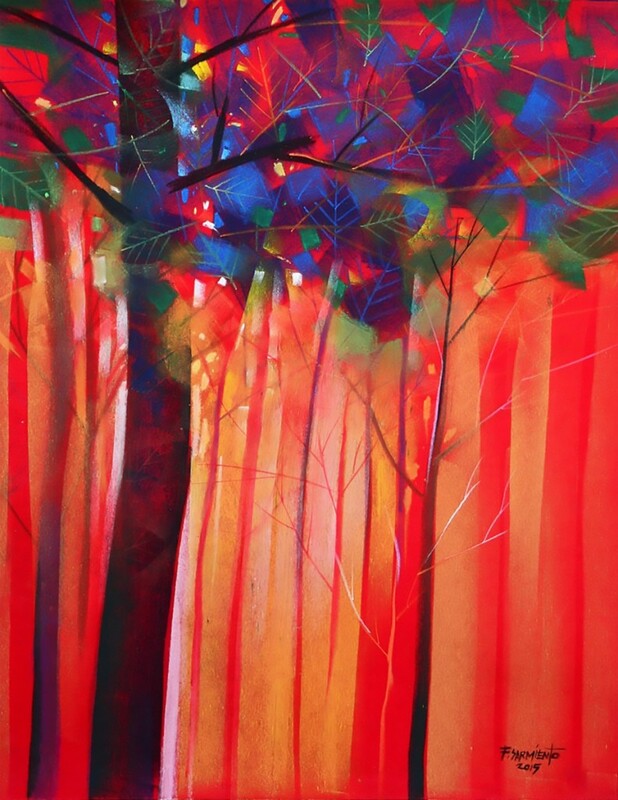 Fidel Sarmiento’s “Kakayuhan” oil pastel on felt paper speaks of a thriving forest beaming with life. 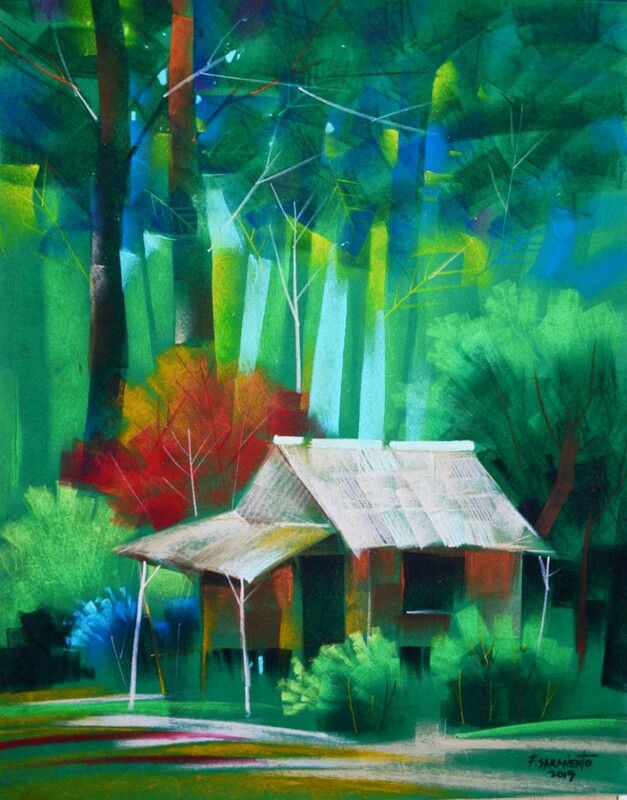 Fidel drew inspiration to this vivid landscape painting that shows his bold use of colour and brush strokes signifying reforestation efforts in preserving biodiversity and climate change protection. In contrast of the Kakayuhan oil pastel in felt paper connotes urgency and action while this painting is reaping the rewards from forest preservation carbon offset projects. Fidel’s “Ang Batis” speaks of a Filipino saying “Ang Batis ng Buhay.” In order for our land to thrive, one must respect and follow the cycle of life, respecting God’s creation so that nature can follow its course. Batis is also liken to life’s many experiences. Just as a river when alive can give life to living things around. 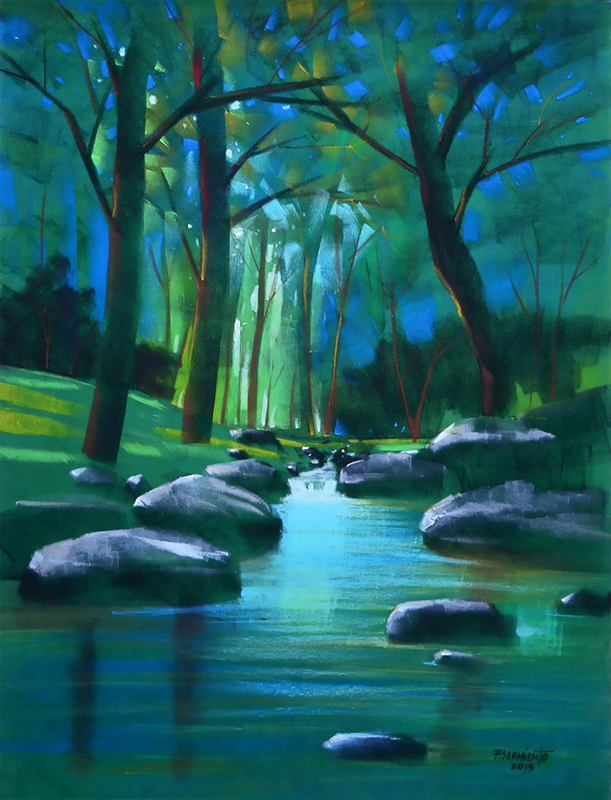 And with time, once it flows downstream, it can never go back. Like a stream, time will slip away. 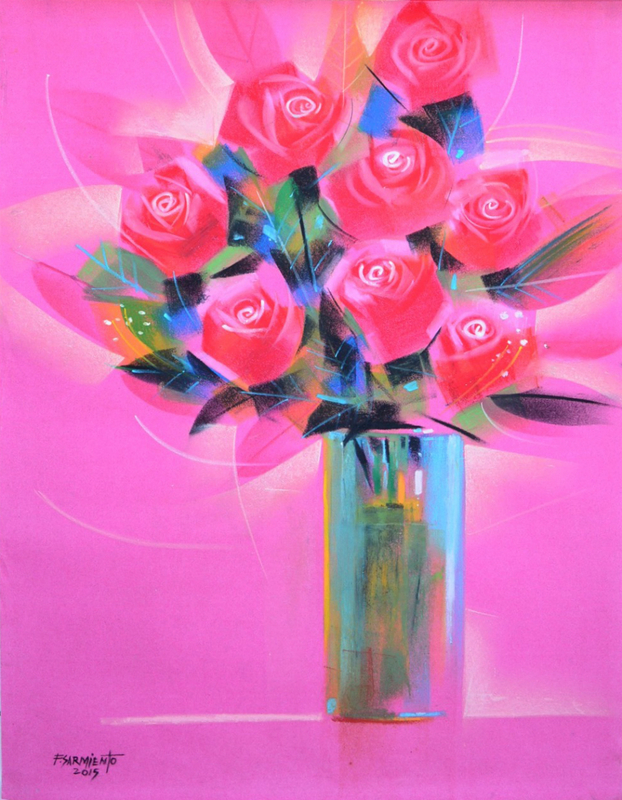 Fidel Sarmiento’s “Rosas Para Kay Mahal” oil pastel is a painting of a bouquet of roses on a vase. This painting features bright pink roses in a clear blue vase accented by complimentary pink as background signifying never ending love. This painting “Rosas Para Kay Mahal” also conveys the depth of motion as “Rosas Para sa Iyo.” The result became a form of expressive abstract imagery. And it speaks of not only the subject itself but rather the time and space of dimensional depth. the site is also high quality. Have a enjoyable.